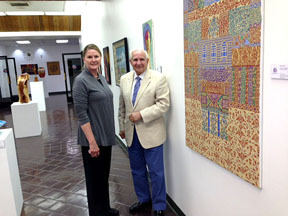 ADMIRING THE ARTWORK at the House of Lebanon are Karen Srour, director, and Judge James Kaddo. It took 13 years of searching before the Lebanese American Foundation finally found a home for its community center. “Just last year we discovered the former Broadway Federal Savings bank building at 4800 Wilshire Blvd. was available,” said Judge James Kaddo, S. Larchmont Blvd., one of the Foundation founders. Kaddo said LAF wanted a secular building that could share the culture, diversity and spirit of the Lebanese people with the community. It is one of the nation’s first urban, Lebanese-American cultural and educational centers. The building will be renovated to meet the Foundation’s goals of offering educational and artistic workshops, It will house a library and screening room for documentaries, a community room and offices for the LAF and other non-profit organizations. Since its opening late last year, the House has staged an art exhibit, conducted workshops in calligraphy and hosted international visitors. “We have a very strong art community whose paintings, photographs and sculptures are feautured in exhibits in the lobby,” said Kaddo. The center also is hosting a meeting for its neighbors, members of the Brookside Residential Association.